German researchers who used a bone marrow transplant to treat a cancer patient with the AIDS virus, have declared him cured of the virus — a stunning claim in a field where the word "cure" is barely whispered. STAMFORD – A woman remains in critical condition Tuesday morning after a sudden attack by a 200-pound chimpanzee at her friend’s North Stamford house Monday afternoon, according to Stamford Hospital. The victim, 55-year-old Charla Nash, sustained serious injuries to her face and body from the mauling, according to police. After police arrived to clear the way for emergency medical workers to treat the critically injured friend, the chimp, Travis, revived and opened the door of the police cruiser. The officer inside fired several shots, killing the chimp. The owner of the chimp, Sandra Herold, and two officers also were hurt, though the extent of their injuries wasn’t clear. The FBI is investigating 38 cases of corporate fraud or financial institution wrongdoing tied to the economic crisis, and the federal bailout watchdog has already opened several criminal probes, officials told Congress Wednesday. U.S. officials also said in testimony prepared for a Senate hearing that fraud cases were straining resources for investigating white-collar crime, and that the U.S. Justice Department backs proposed legislation to tighten financial-fraud laws. Neil Barofsky, special inspector general for the $700 billion U.S. Troubled Asset Relief Program, or TARP, told the Senate Judiciary Committee that several criminal investigations related to the program were already under way. Feb. 12 (Bloomberg) — Pope Benedict XVI said that he plans to make his first trip to Israel at a time of rising tensions between the Vatican and the Jewish state over Benedict’s decision to lift the ex-communication of a Holocaust-denying bishop. Benedict didn’t give details of the timing of the visit, his first since becoming leader of the world’s Catholics in 2005, in a meeting with U.S. Jewish leaders in Rome. He used the opportunity to condemn the Holocaust and those who deny it happened. “The hatred and contempt for men, women and children that was manifested in the Shoah was a crime against God and against humanity,” he said at the meeting in Rome, according to a text of his statement on the Holocaust on the Vatican’s Web site. LOS ANGELES – LOS ANGELESA big share of the financial burden of raising Nadya Suleman’s 14 children could fall on the shoulders of California’s taxpayers, compounding the public furor in a state already billions of dollars in the red. Even before the 33-year-old single, unemployed mother gave birth to octuplets last month, she had been caring for her six other children with the help of $490 a month in food stamps, plus Social Security disability payments for three of the youngsters. The public aid will almost certainly be increased with the new additions to her family. Also, the hospital where the octuplets are expected to spend seven to 12 weeks has requested reimbursement from Medi-Cal, the state’s Medicaid program, for care of the premature babies, according to the Los Angeles Times. The cost has not been disclosed. Word of the public assistance has stoked the furor over Suleman’s decision to have so many children by having embryos implanted in her womb. WASHINGTON — U.S. retail sales jumped 1 percent in January, reversing a six-month declining trend and defying economists’ expectations by posting the biggest increase in 14 months. But higher gasoline prices and sales, and buyers snapping up other items on post-holiday discounts appeared to aid last month’s results. Analysts cautioned that the relief is unlikely to last. The Commerce Department reported Thursday that January retail sales rose 1 percent from December after having fallen for six straight months. Wall Street economists surveyed by Thomson Reuters had expected January sales to show a drop of 0.8 percent. They plunged a revised lower 3 percent in December, which marked the weakest holiday selling season since at least 1969. You know times are tough when the rich start cutting costs on their mistresses. According to a new survey by Prince & Assoc., more than 80% of multimillionaires who had extra-marital lovers planned to cut back on their gifts and allowances. Still, only 12% of the multimillionaire cheaters said they plan to give up on their lovers altogether for financial reasons. 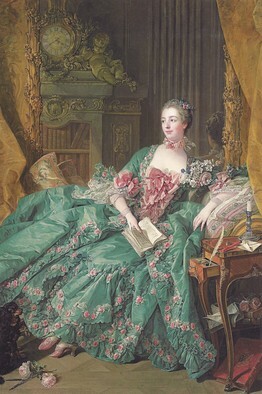 A portrait by François Boucher of Madame de Pompadour, the mistress of King Louis XV of France. BOSTON (Reuters) — The wife of accused Wall Street swindler Bernard Madoff pulled $15 million out of a brokerage account only days before her husband was arrested, Massachusetts’ top securities regulator said Wednesday. Secretary of State William Galvin said Ruth Madoff withdrew $5.5 million on Nov. 25 and $10 million on Dec. 10 according to reports produced by Cohmad Securities, a firm co-owned by her husband. Madoff is accused of masterminding a $50 billion Ponzi scheme. He was arrested and charged with securities fraud on Dec. 11. In a Ponzi scheme, early investors are paid with money from later investors.